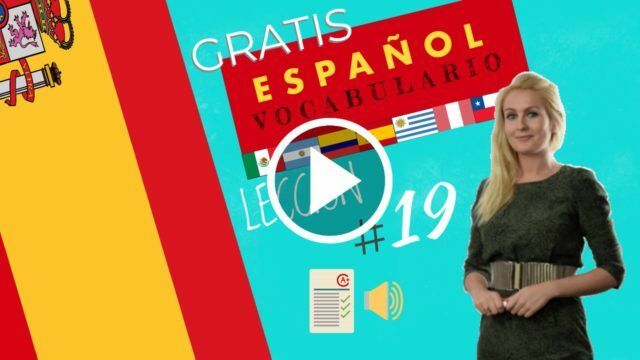 Dialogue in Spanish with English subtitles about the Present irregular 1st singular person Spanish. Lately my life is a little repetitive and boring. Everything is very mechanical. The alarm clock goes off at eight in the morning, I wake up and get up quickly. I shower, wash my hair and dress at full speed. I have toast for breakfast and I leave home at eight thirty in the morning. I take the bus because my car is broken. I go to work and I arrive there at 9 o’clock. I stay in the office all morning. I take a break to drink a coffee at eleven thirty in the morning and I have a croissant. At one o’clock I leave work to go home to eat. I often sleep a little ten-minute nap. At three o’clock I go back to work. In the afternoon, I only have a ten-minute break at approximately five-fifteen and have a sandwich with another coffee. I leave work at seven o’clock and go to a language school to learn Spanish. I always sit in the front row because that’s how I get better in class. I return home at a quarter to ten. I have dinner, I watch TV a bit and almost always go to bed at midnight. Really from Monday to Friday I don’t have free time. I often want to do other things but I do not have enough time. On weekends I get up late and go to the movies. Sometimes I go shopping with my friend Elsa, sometimes I go out to the country side…, but I do not know, I do not know. I’m getting bored. I’m almost never satisfied. I need something more. Esteban’s life seems more interesting, for example. He gets up early and goes to bed late because he does many things. He showers, shaves, goes to the gym every day and works but gets time to do other things but I do a lot less activities. He does a lot of sport, often dresses elegantly because he goes partying, studies hard and has many projects. I think I can learn a lot from him. 1- What does Alba write in her diary? Alba writes about her life that lately is a bit repetitive and boring. 2- What does Alba do when the alarm goes off? Alba gets up quickly, takes a shower, dresses at full speed and has toast. 3- What time does Alba take a break in the morning? Alba takes a break at 11:30 in the morning to drink a coffee. 4- What time does Alba take a break in the afternoon? In the afternoon, he only has a ten-minute break at approximately five-fifteen. 5- Where does Alba sit in the language school? Alba sits in the front row because that’s how she finds out about classes better. 6- What does Alba do on weekends? On weekends, she gets up late and goes to the movies, sometimes goes shopping with her friend Elsa. 7- Why, according to Alba, Esteban’s life seems more interesting? Because he gets up early and goes to bed late and does many things and more activities than Alba. 8- What is Alba’s conclusion? Alba thinks she can learn a lot from him. Present irregular 1st singular person Spanish.